How do I solve this F2L case quickly? I have been unable to find a solution for this f2l case. It takes about 3 seconds to do, and I do it really slowly. Basically, the f2l case is solved, but the edge is inverted. The way I do it right now is that I take it out, split it up, and insert it in again. How can I complete this in the fastest time possible? It's a bit long, but it's an intuitive sequence of moves. I'm using the brackets to denote intuitive blocks. 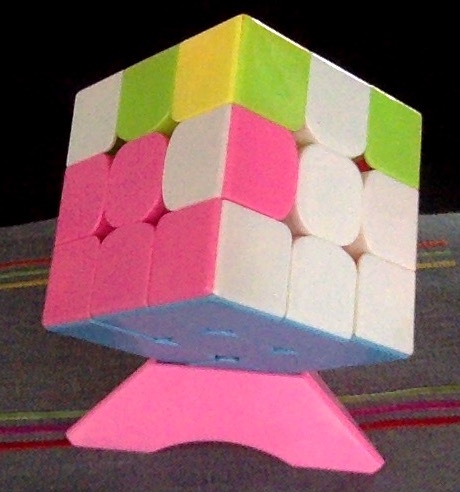 [R U R' U'] removes the corner-edge pair. [R' F' R] sets the rebuilt faces back in place. At my top speed, this takes significantly less time than three seconds - and I'm fairly out of practice, at that. It's also worth noting that these positions are relatively straightforward to see coming, and oftentimes, simple adjustments to the order and choice of moves for other edge pairs will prevent this from happening at all. If you see such an eventuality, take a moment, stop, and consider what you can do to prevent it in the future. Solved Rubik's 3x3x3 - should I do the 4x4x4 next?